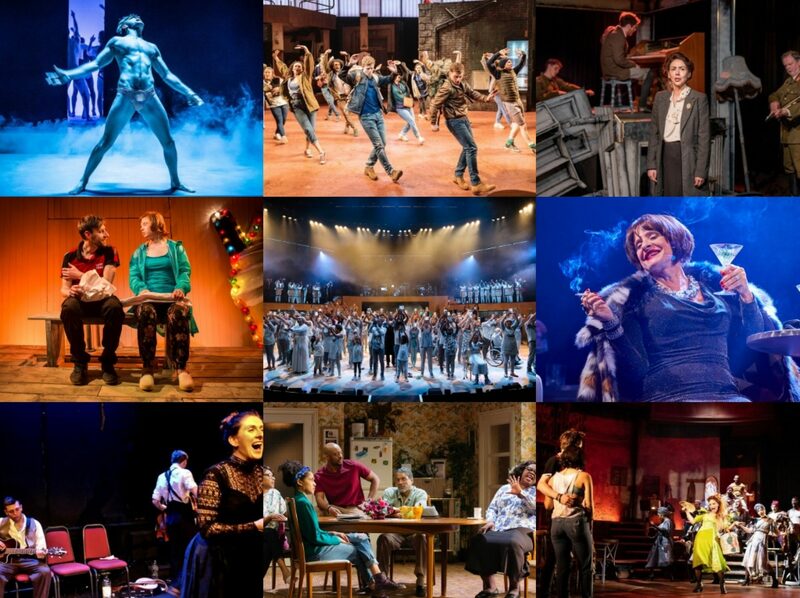 Lynn Ahrens and Stephen Flaherty’s Ragtime was one of the highlights of the musical year in London and along with their revival of Howard Goodall’s The Hired Man, marked a year with remarkable highs for the Landor Theatre in Clapham. 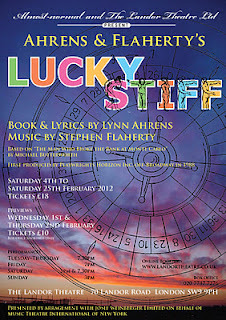 Their small-scale but big-impact productions have proved a welcome boost to the London fringe musical scene, marked by their success in the Offies awards last week, and the Landor are clearly looking to maintain that by reviving Ahrens and Flaherty’s first show Lucky Stiff. A frivolous musical farce, based on Michael Butterworth’s The Man Who Broke The Bank At Monte Carlo, the plot revels in the nonsensical and ridiculous as we caper from a dowdy English shoeshop and an Atlantic City optometrist’s office to the glitzy casinos of Monte Carlo with gay abandon. Harry Witherspoon’s existence selling footwear is thrown into chaos when an unexpected bequest from an unknown uncle falls into his lap, but with certain strings attached. In order to get his inheritance, Harry needs to take the embalmed body of his uncle on a trip to Monte Carlo and pass him off as alive, or else the money will go to the Universal Dog Home of Brooklyn. Further complicating matters is the uncle’s lover Rita, six million dollars worth of diamonds that have gone missing, an over-friendly Italian, cross-dressing maids, a representative of the dogs home with her eyes on the cash and a suspicious-looking Arab, as everyone descends on the South Coast of France in a madcap rush with much confusion ensuing. James Winter brings an appealing likeability to his everyman Harry, a clear-voiced beacon of relative normality who comes to revel in the freedom offered by his change in circumstance, and his burgeoning relationship with Abigail Jaye’s dog-obsessed Annabel is well portrayed, her comically bookish earnestness slowly melting in Winter’s handsome presence. But it is Lucy Williamson’s brassy and brashy legally blind Rita, complete with outrageous New Yoik accent and double takes aplenty, who seizes the comic honours with huge amounts of fun. But farce requires more than just good performances to really be successful, it needs a finely calibrated play supported by a production which is whip-sharp and here, Lucky Stiff doesn’t quite hit the mark. Ahrens’ book flails a little with its multiple locations in the first half, straining the capabilities of the design; and whilst Flaherty’s songs are pleasant enough they largely lack lyrical bite or distinct enough tunes, and more importantly they rather disrupt the flow of the show, making it hard for Rob McWhir’s production to establish and maintain the comic energy it needs to pass as engaging entertainment. Uncomplicated fun is fine, but good comedy especially farce is rarely at all simple – just look at the intricacy of Noises Off’s second act – and it feels at times as if we are witnessing the growth of Ahrens and Flaherty’s writing rather than the fully fledged fruit. McWhir does work extremely well with what he has though and with a strong ensemble often doubling up, sprightly musical direction from Terence Penk and a touch of enlivening choreography from James Houlbrooke (who also provides amusing onstage support, a potential boyfriend for Joan the Mute perhaps…? ), creates much of interest.